From silencing debate on guns to backing “textbook-racist” Trump, the GOP “leader” always puts partisanship above principle. The New York Daily News has a way of settling issues with front-page headlines. And the feisty tabloid’s headline on the morning after Speaker Paul Ryan shut down the House rather than allow a debate on gun-violence legislation settled it for Ryan. A picture of the speaker appeared next to a headline “NRA’s Li’l Lapdog.” Perched on Ryan’s shoulder was the chief apologist for the gun industry, National Rifle Association taskmaster Wayne LaPierre, screeching “Heel, Paul, heel. 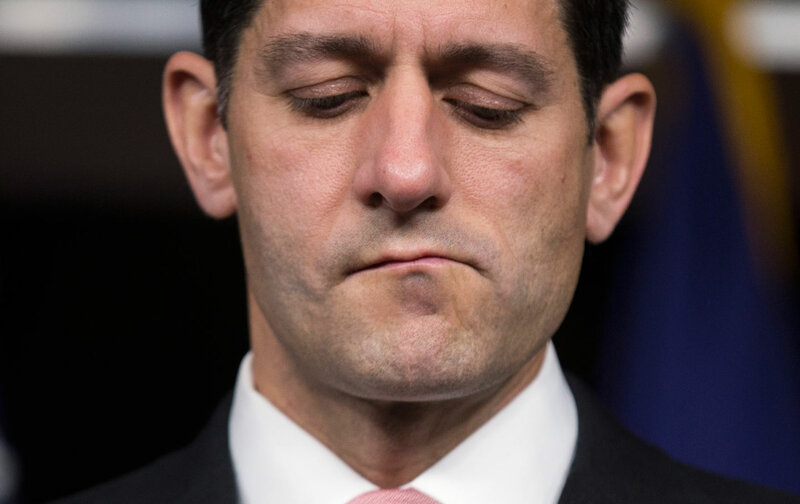 Good boy!” A smaller headline ridiculed Ryan for claiming that he was upholding the Constitution when, in fact, the Wisconsin Republican was doing the bidding of the gun interests that have so consistently and generously funded his campaigns when he adjourned the House in the early hours of June 23. Now that he is at the top of the political ladder, Paul Ryan is revealed as nothing more than a cynical careerist. The key word there is again. Over the course of a quarter-century career on Capitol Hill, as a congressional aide, “think-tank” hanger-on, and safe-seat congressman, Ryan has carefully crafted an image of himself as a more intellectually advanced and reasonable Republican than his wild-eyed compatriots. Ambitious in the extreme—despite the “reluctant hero” performance art that has become his specialty—Ryan has steadily grasped for more powerful positions: the House Budget Committee chairmanship, the House Ways and Means Committee chairmanship, the Republican nomination for vice president and the House speakership. Yet, now that he is at the top of the ladder, Ryan is revealed as nothing more than a cynical careerist, with no political courage and no clues about how to wield the power he has attained for any purpose other than rewarding his corporate benefactors. The speaker’s authoritarian refusal to allow votes on popular pieces of gun-violence legislation was rebuked this week by House Democrats, with an unprecedented sit-in led by civil-rights icon and Georgia Congressman John Lewis. Ryan’s speech-police scheming to silence debates with empty “moments of silence” is now ridiculed by his colleagues and the media. When he is not shutting down debate in the House—and shutting off C-SPAN cameras while members who do not follow his dictates speak on the floor—Ryan is backing Donald Trump for president. The speaker grumbles now and again when Trump disregards whole sections of the Constitution or makes what the speaker describes as “textbook racist” statements. But from the start of the 2015 campaign, Ryan has pledged to place partisanship above principle and back the GOP nominee, providing cover for Trump at points when responsible Republicans were declaring that they could not accept the billionaire as their candidate. No Republican has done more to facilitate Trump’s rise than Paul Ryan. Why? Instead of taking the risks that go with being a leader, Ryan chooses to follow—on the campaign trail and on Capitol Hill. This is the reality of the Republican “leader” who will not lead. His determination to silence debate on gun violence confirms that this speaker will never make the public interest a priority. The shaming of Paul Ryan is now complete.